The gospels simple truth leads to organic, natural growth. The Bible gives us several case studies on how this works. One of my favorites is Zacchaeus (Luke 19:1-10). Zacchaeus went from being one of the most selfish men in ancient Israel to one of the most generous without being commanded to. Zacchaeus was not a good man. In fact, he was a downright bad man. A wee, little, bad man. The Romans had problems collecting taxes from conquered cities. The people would buy and trade on the black market and evade the tax. A transplanted Roman official would not be familiar enough with the city’s underside to know where all the real money was. So the Romans hired a native from the conquered city to collect the tax for them— someone who would know where the money was hiding. The tax collectors were then given a garrison of soldiers to assist them. The Romans did not care how much extra the tax collectors collected for themselves. As long as they got their share, they turned their heads. As you can imagine, tax collectors got very, very rich. In other words, Zacchaeus’ substantial wealth came from selling out his family and friends to an imperial foreign power. Zacchaeus evidently didn’t care, however. He loved money. That’s the only way you would ever consent to being a tax collector. Money had to be worth more to you than everything. Seriously— can you imagine a worse person? But then the unexpected happened. Jesus looked up into Zacchaeus’s tree and said, “Zacchaeus, come down. I’m coming to your house for dinner.” What exactly was said at that dinner party we don’t know, but we do know the effect it had on the Zacchaeus. He said, “I will pay back anything I’ve stolen four times.” On top of that, he gave away 50 percent of his treasures to the poor. There is no record of Jesus’ commanding Zacchaeus to respond like that. In fact, Zacchaeus goes way beyond the Levitical requirements of restitution. There was only one time that you have to pay back four times, and that was if you’d stolen somebody’s cow. And there is certainly nothing in the law about giving away 50 percent. Zacchaeus evidently just did it because he felt like it. New Testament scholars say there is a certain playfulness in the way Zacchaeus informs Jesus of what he’s about to do. He’s not like, “Oh Sovereign Lord, in humble response to Your requirement, I give what Thou demands. Please accept my humble offerings in due recompense for the wicked things I have done.” The tone of Zack’s language is, instead, rather kid-like. Almost, “Look, Dad, watch . . . look at what I’m doing! Look, Dad, no hands!” He’s bubbling over with giddy generosity. He’s tipsy on giving. He’s not giving away money because he has to— he’s giving away money because he wants to. Zacchaeus went from being a man who sold his soul to the god of money to a man who gave everything away with a joyful heart. What caused that change? The focus of the story is how Jesus treated Zacchaeus, a sinner. Jesus called him down from the tree when everyone else forced him away from them and up there. We also know that Jesus went to eat with Zacchaeus before he repented. In that day to share a meal with someone was a sign of acceptance, even intimate fellowship. To eat with someone means you were embracing them. Therefore, the Jewish leaders were understandably upset and objected: "What is he doing eating with a guy who is known to be a sinner?" But Jesus produced in Zacchaeus, something in that moment, something the Jewish law had not been able to do. Jesus looked at a wee little bad man in a tree— who was there because he was despised, an outcast, and rightfully so— and gave him an invitation of acceptance and intimacy. 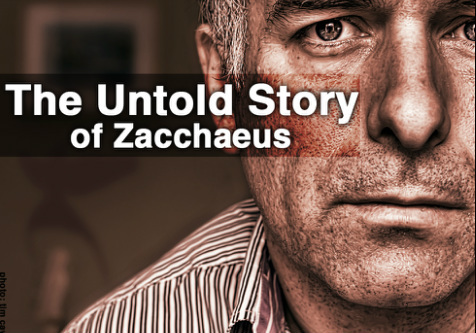 That experience changed Zacchaeus forever. Every other religion in the world would have said to Zacchaeus, “If you change, you can find God. If you change, you can find acceptance and salvation.” Zacchaeus was not changed by a command of Jesus, but by an experience with Jesus. But the gospel is the opposite of religion. Jesus said to Zacchaeus, “Zacchaeus, salvation has come to you. You didn’t go out and find salvation. It has found you.” Zacchaeus was not changed by a command of Jesus, but by an experience with Jesus. When Zacchaeus tasted of God’s grace, he was transformed from a man of greedy exploitation to one of lavish, exuberant, bubbly generosity. Unfortunately most preachers still think that preaching the law in some way is how we can change our congregations. “Do tithe.” “Do give sacrificially.” “Do downsize.” Around our church we call those “do-do” sermons. They give you a list of things to do and make you feel worthless when you don’t do them. Preaching of this type might sometimes produce a large offering, but they produce nothing of real value in God’s sight. The preaching of the law produces only Pharisees. They might be Pharisees who fast twice a week, tithe their spices and cumin, and refuse to walk more than a certain amount of steps on the Sabbath. Or, they might be Pharisees who give away lots of money, adopt children, and go on mission trips. Either way, they are only Pharisees. Their focus is on external change, while their hearts are filled with poison. They are immaculately obedient tombs. Give the Pharisees their due credit: they were quite zealous in their obedience. Many gave away lots of money. Some traveled the world in search of converts (see Matt. 23: 15). They were always at prayer meetings and no doubt the first ones to sign up for volunteer teams. But they were also bitter, resentful, dissatisfied, and self-focused. And they hated Jesus Christ. God does not want Pharisees. He wants people who overflow with the joy of serving Jesus. Like Zacchaeus we will not be transformed by the command of Jesus; we will only be changed and transformed by an experience with Jesus. Obedience to commands is an essential part of the Christian life, but the power for transformation doesn't come from them. The power of transformation comes from the gospel. We are not changed by being told what we need to being doing for God, but by hearing the news about what God has done for us. Gospel change is the Spirit of God using the story of God to make the beauty of God come alive in our hearts. Having our eyes opened to see our part in that story creates in us a love for God that is strong enough to drive out our attraction to other idols. For the grace of God has appeared, bringing salvation for all people, training us to renounce ungodliness and worldly passions, and to live self-controlled, upright, and godly lives in the present age, waiting for our blessed hope, the appearing of the glory of our great God and Saviour Jesus Christ, who gave himself for us to redeem us from all lawlessness and to purify for himself a people for his own possession who are zealous for good works. (Titus 2:11-14). In this passage we see a pretty good list of what the gospel helps us to do. It helps us to renounce ungodliness, worldly passions in our daily living as well as to live self-controlled, upright and godly lives. But what helps us in to develop through and in these things? What is it that trains us to do these things? Bible memorization? Accountability partners? Baptism in the Spirit? Radical devotion? No and it is not that these things don't have a place but Paul tells us that it is the "grace of God that us to renounce ungodliness and worldly passions, and to live self-controlled, upright, and godly lives in the present age". It is the literal pursuit of God who came into this world for you, died for you, rose to life for you, and who will come back for you that will sustain you. His grace is not only our invitation into the gospel story, but it is the power of God's mercy that gives us repentance, the power of God's love that gives us salvation, and the gift of God's Spirit that enables and empowers us. And as wonderful as that is we need to understand just how dependent we are on Jesus. Thus, His focus is not on behaving; it is on believing. Threats, commands, three point propositions, and action steps will change our behavior externally. It is only when we get caught up in the story of Jesus do our hearts change.